There are many factors which contribute to positive education outcomes in a school environment. Purposeful design of campuses, buildings, social spaces and classrooms can facilitate deeper learning, greater social connectivity and a more discernible connection between the culture of a school and its architecture. This article is the first of a two-part series by Bek Park on behalf of Sunshine Coast Council, exploring what good design looks like in the context of a school, inspired by two local events: a presentation by Brisbane-based architects m3architecture on ‘Good Design for Positive Education Outcomes’ hosted by the Sunshine Coast Creative Alliance, and the Open House Sunshine Coast forum, ‘Architecture for Good’. The concept of “good design’ offers designers a broad frame of reference for how the architecture and environs of a campus reflect the culture, pedagogy, history and vision of a school. Good design seeks to conceive a campus agreeably positioned within the landscape, with harmonious aesthetics across the built environment and consciously designed social spaces. Critically, it connects the built experience to the school’s values. he development of a long-term framework for advancement. The output from master planning is a physical document that sets the agenda for what happens next, ensuring a consistent approach for individual projects across a site. 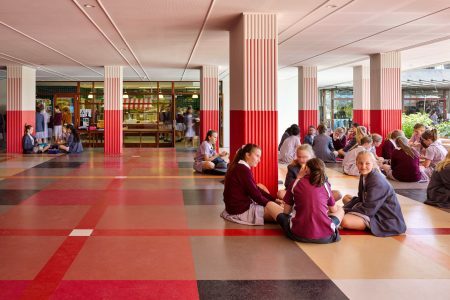 Ben Vielle from award-winning Brisbane-based architects, m3architecture, notes that for existing schools, useful observations can be made by walking through the school and observing how space is utilised. “By taking a walk through every room on campus, we are able to perceive the physicality of the school, how it operates, whether the current timetable is efficient, the pedagogy around subjects and how that connects to each piece of architecture,” Ben explained. The value of assessing existing space prior to investing in new facilities was evident when their team was invited to design a new classroom for St Joseph’s Nudgee College. 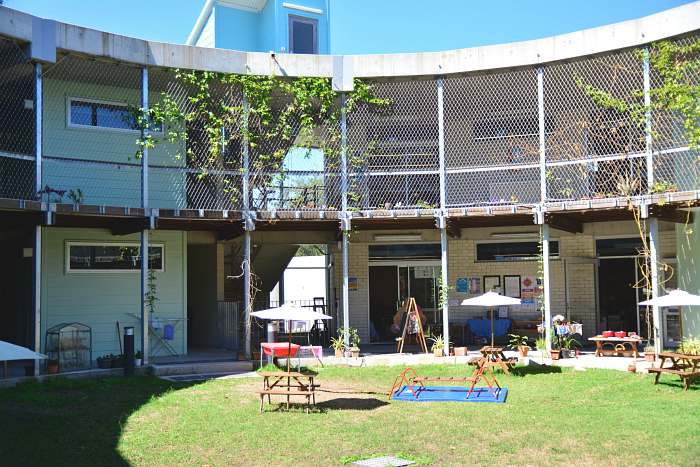 In 2015, the multi-award winning Montessori International College (MIC) campus opened in Forest Glen on the Sunshine Coast, welcoming 235 students. A benchmark for education and sustainability, the project was a collaboration with architect and urban designer, Dr Phillip Daffara of PlaceSense. The college had outgrown its original location in Sippy Downs, offering the opportunity to apply an holistic, design thinking approach to selecting a new site and master planning. “As an architect and foresight consultant, I choose to work with clients and communities who seek clarity of place, vision, values, design qualities and purpose who are willing to undergo transformation driven by that clarity. These are the seeds of doing good work which may lead to awesome architecture if the clarity remains consistent throughout the project and through occupation,” Phillip said. Ahead of site selection, the PlaceSense team led the MIC community through a master planning process that involved students, teachers and parents. The guiding principle that unfolded from this process was ‘solutions grow out of place’. Good design in a school context involves understanding the collective identity and daily experiences of both teachers and students, so spaces can be designed to enhance both learning and social interaction. Research suggests good natural light, natural ventilation and the right acoustics are beneficial in study environments. In m3architecture’s education projects this generally translates to buildings three to five storeys high, that are no wider than 14 metres and oriented to the north. Such positioning maximises natural light and cross ventilation, providing fresh air to classrooms and reducing reliance on electricity. Taking the time to understand the localised pedagogy of each school enables the development of tailored learning spaces such as specialised laboratory styles for science or distinctive art studios, which Ben says offers deeper learning for students and more enriching spaces where teachers can shine. At MIC, the vision was for places of learning to teach the school community about the world in which we live, offering the opportunity to explore nature-based solutions. With place as a teacher, the school has become a living laboratory for the study of water quality and aquatic species in Eudlo Creek and management of the vegetation covenant area through Land for Wildlife. Senior students manage an organic farm, keeping the land productive. 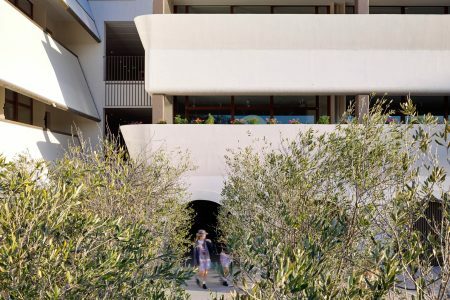 Similarly, the long-term vision for Mount Alvernia College in north Brisbane reflects the school’s Franciscan history, St Francis’ love of the natural world and the relationship between humankind and nature. The master plan undertaken by m3architecture acknowledged the importance of the natural world to the school community: three gardens were established, along with a new social space, cafeteria and commercial kitchen with easy access to the garden, offering students a seamless experience of indoor and outdoor spaces. Something almost magical happens when building design and materials are connected to the identity of a school. Ben says the challenge is recognising elements of cultural identity that have architectural traction and can guide building design. At Mount Alvernia, the students naturally gravitated towards sitting picnic-like on the floor of a quadrangle area which became inundated when it rained. A visual material language was created by m3architecture to augment those social customs, with an elevated floor in the style of a large picnic blanket. By relocating buildings from the former campus, part of the original MIC story was conveyed to the new campus while also achieving the goal of reusing existing buildings to save materials and energy where possible. Selecting natural building materials for new construction projects was an important aspect of creating a green school, according to Phillip. Adopting the principles of good design creates a tangible connection between the school’s values and its built environment, that in turn offers additional benefits. “By approaching design in this way, what you do and what you stand for becomes clear, acting as a visual marketing tool for the school,” explained Ben.